You’re hosting a sophisticated dinner party. Your appetizers are amazing; your main course is to die for. And dessert – oh, we can only imagine! But most importantly, you serve an incredible selection of wine. A sweet rich pinot gris. A refreshing, fruity pinot grigio. Perfect. Then someone asks you, “What’s the difference between pinot gris wine and pinot grigio?” Um… hmmm. What is the difference? Well… Pinot gris and pinot grigio do come from the same grape. It originated in France. There, it is cultivated in Alsace and the resulting wine is known as pinot gris. In Italy, it goes by pinot grigio. This is not the only difference, however. French pinot gris wines are rich, spicy, and have a thicker, more viscous texture. They also age superbly. Italy, which is credited to popularizing pinot grigio (thanks, Italy! ), produces a lighter, crisp, fresh wine with bright fruit and floral notes. Today, pinot gris and pinot grigio grapes are cultivated all over the world; usually, you’ll find the more Italian-inspired flavors. But some regions, notably Oregon and New Zealand, take their cue from the French and produce a more rich, textured pinot gris taste. Now the big question: what do you serve with pinot grigio and what pairs well with pinot gris? For pinot grigio, try light dishes. Think fish, grilled shrimp, and airy appetizers. Want to get hearty? Pair pinot gris with roasts, hard cheeses, veal, rabbit stew – and elevate your comfort food chicken casserole with a perfectly chilled glass. Well, now you’re prepared when someone asks you the difference between pinot gris wine and pinot grigio! Better yet – be prepared with a delicious bottle from your favorite label. Your guests will thank you. More importantly, you will thank you! Wine and relaxation seem to go hand in hand. After a long day, one way to restore calm is to savor a glass of your favorite red, white, or blush. Science confirms what we’ve all known: wine relaxes you! Drinking wine in moderation can help us unwind, de-stress, and find balance even during our most unbalanced days. 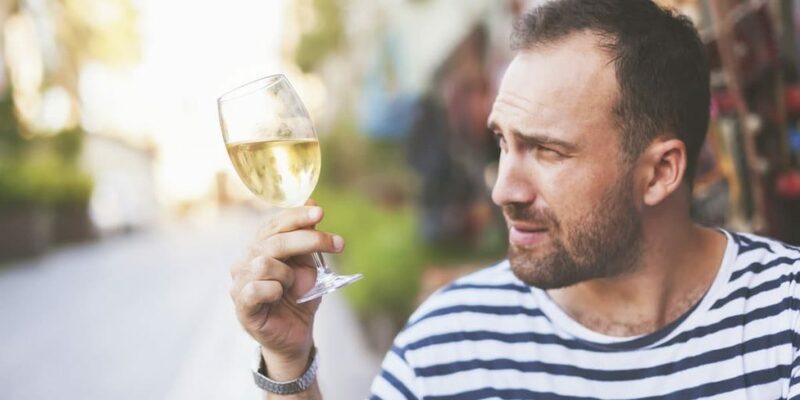 According to Dr. Jacob Teitelbaum, a board-certified internist, drinking wine “is one of the most time-honored ways for disconnecting our brains at the end of the day.” He explains that it calms “transiently, because it is a central nervous system depressant.” It can, essentially, offer a sedative effect. Also if you have acid reflux (which tends to flare up at night) or gastritis, it is best to avoid wine at bed because it can make these conditions worse. The best way to combine wine and relaxation is to have a glass with dinner. It will produce the calming effect you want without impeding your ability to sleep. The next question is what’s the best wine for relaxation? Your favorite, of course! But if you want a little extra kick for health, experts recommend going with a red. Resveratrol, present in red wines, is linked with increased lifespan. As Dr. Teitelbaum says, “What a great way to live long and love living!” We couldn’t agree more! Wine relaxes you; enjoy in moderation and you’ll build some peace and serenity into your day! When we celebrate an important event or occasion, champagne is not far behind. Weddings, anniversaries, job promotions, graduations, New Year. It is the most beloved – universal – treat when we want to give thanks and share joy with our loved ones. But why? What makes champagne the celebratory wine? Let’s find out! In days past, this may have been because champagne was so exclusive. From the Champagne region of France, it was the choice of royalty; it’s said that Palais Royal guests loved the way the cork came “jumping out of the bottle!” And Louis XV’s “official chief mistress,” Madame de Pompadour, was famed for ordering 1800 bottles for just one party. The rest, as they say, is history. Or legend. No matter! But as the bottles could explode if the sugar ratio was not perfect, champagne became ultra-exclusive – and ultra-expensive. Cue the Royals. When you choose wine for celebrating, champagne is at the top of the list. A toast would not be complete without it! Tip: If you have a special occasion to mark, serve your favorite reds and whites and save the champagne for the big announcement, the toast, or when the ball drops. Cheers to celebratory wine!